Eight years ago, several U.S. Navy destroyers used sonar in the Bahamas during routine training exercises. Within 36 hours, 17 animals—including 14 beaked whales, one of the world’s deepest-diving whale species—were found on three islands nearby. Ten of the animals eventually refloated or were pushed back into the water, their fates unknown. The remaining seven died on the beach. Researchers examined the whales and found that they had died of heatstroke. Speculation arose that the sonar had somehow disrupted their diving behavior or disturbed them and caused them to swim to shore. Some of the whales also had hemorrhages near their ears and in the fluid surrounding their brains, which may have affected their hearing. 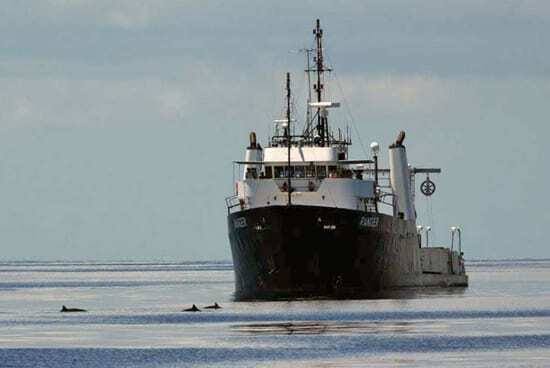 The unusual mass stranding, one of the few on record involving beaked whales, drew attacks on the Navy from environmental groups and attracted interest from biologists, including Peter Tyack at Woods Hole Oceanographic Institution (WHOI). At the time, little was known about any species of beaked whales, elusive mammals named for their beaked skull. But Tyack knew it wasn’t the first stranding of its kind. 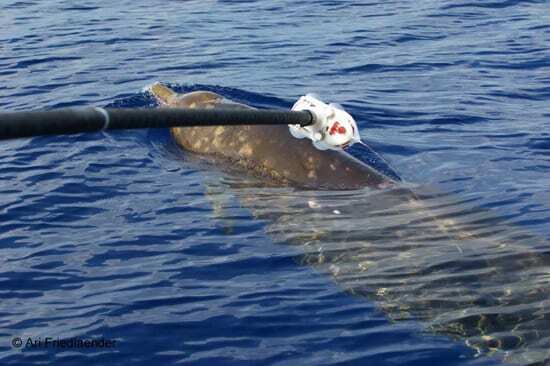 Five similar strandings of beaked whales had coincided with naval exercises near Greece and the Canary Islands. “One or two whales stranding isn’t unusual, but when we see larger numbers of whales stranding within a few hours over tens of miles of coastline, we know that there is something weird going on,” Tyack said. 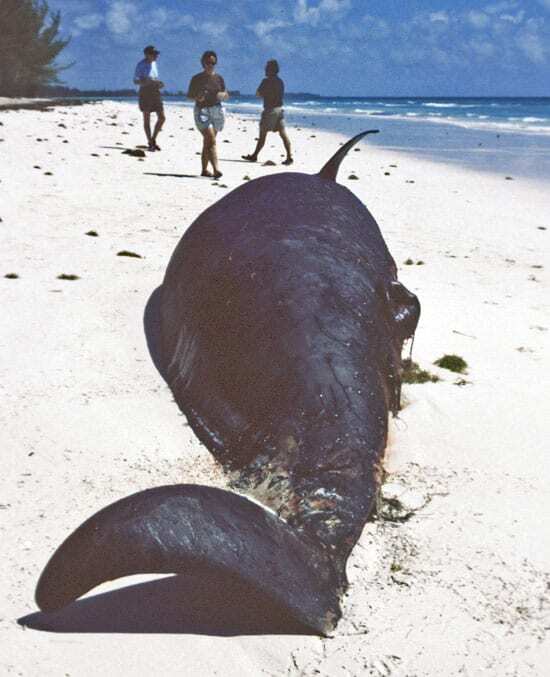 These aytpical mass strandings were first reported by Alexandros Frantzis, a biologist at the University of Athens, in March 1998 in the journal Nature. Though sonar is vital to its operations, the U.S. Navy has since acknowledged the problem it can pose to some whales. To learn more about sonar’s impact on beaked whales, the Navy opened the doors for researchers to use its extensive Atlantic Undersea Test and Evaluation Center—an interconnected seafloor system of 81 hydrophones (underwater microphones) arranged in a grid over 600 square nautical miles southeast of Andros Island, not far from the strandings in 2000. The three-year research effort, which includes $6 million in funding from the U.S. Department of Defense and the U.S. Navy, was launched in fall 2007. Schregardus said that results uncovered through the study, which will continue this fall, would allow scientists to begin understanding how beaked whales react to human-produced sounds. It could also be used by the Navy to modify existing protective measures, develop thresholds for sonar, or perhaps explore modifying the sonar signal itself. Nevertheless, sonar remains one of the Navy’s most essential tools. The Navy’s ongoing use of sonar for anti-submarine warfare training along U.S. coasts has drawn opponents. In mid-January, President Bush signed a waiver exempting the Navy and its anti-submarine warfare exercises from limitations on sonar use for training off the California coast, arguing they are vital to the nation’s national security. That decision was overturned in early February by a U.S. District judge. undefinedNavy officials said they are studying the decision and have not made their next legal move clear. 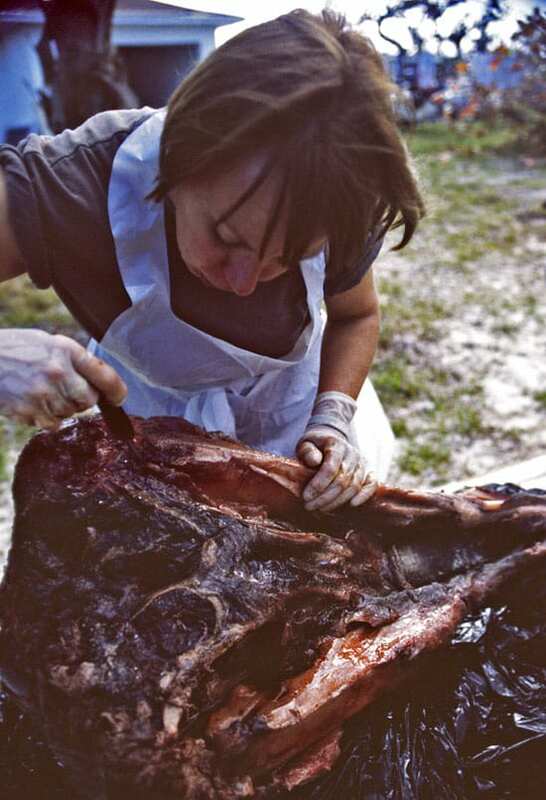 Darlene Ketten, a biologist at WHOI, examined the dead stranded whales in the Bahamas in 2000. She said that it is important to remember that what killed the animals wasn’t a blast from sonar itself. They died from injuries suffered as a result of stranding. Another critical question is why the strandings seem to have occurred in several specific places. Ketten said that sonar tests had occurred for years off Puerto Rico with no documented mass strandings. 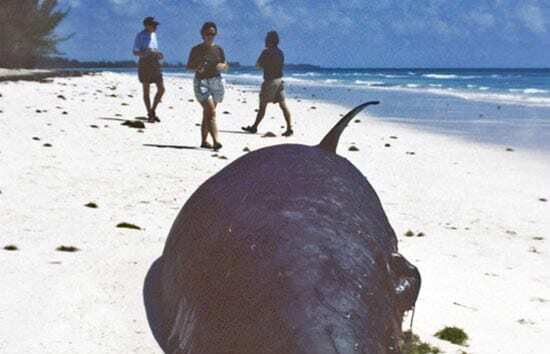 And Tyack said that there are no reports of atypical mass strandings of beaked whales along the West Coast, including California and Hawaii, though there have been several strandings in Alaskan waters. Each stranding location near Europe and the Bahamas did have characteristics in common, said biologist Brandon Southall, a principal investigator on the project who directs the NOAA Ocean Acoustics Program, based in Washington, D.C. All occurred only in tropical and subtropical areas with steep cliffs on the seafloor. Each shared similarities in how the water temperature varied with depth, which can cause sound to travel greater distances near the surface than it might otherwise. “This provides some information about what set of circumstances would need to be avoided when using sonar, but we don’t have a real road map yet,” he said. Reports of how the whales were injured as a result of stranding after exposure to sonar seem to vary. In the Canary Islands—but not the Bahamas—researchers reported that some stranded beaked whales had gas bubbles in their organs and veins. Researchers theorized that the animals may have suffered from a marine mammal form of decompression sickness, or “the bends.” It was a curious symptom for whales whose lungs collapse early in their dives, which deters decompression sickness by preventing bubbles from entering their bloodstreams on deep dives. Also puzzling is why sonar seems to have impacts specifically on beaked whales, Ketten said. Although many marine mammals were in the area, only the beaked whales stranded and died. Their particular physiology may be a factor, she said. Compared to other whale species, “they may be ‘nervous Nellies,’ ” she said. When Tyack first learned of the sonar-related strandings, he and WHOI engineer Mark Johnson were developing a non-invasive tag at WHOI to digitally record sound and the movements of marine mammals. The cell phone-sized devices, called D-tags, attach to whales with suction cups and stay on during a dive. The tags don’t disturb the animal, which is critical for scientists set on observing and recording normal behavior. D-tags record and store what an animal is doing and what its environment is like. Beyond time, depths, and sounds, the tag records temperatures in the ocean surrounding the whale, and the whale’s pitch, roll, speed, and direction. It measures sound 192,000 times per second and other information 50 times per second. After 18 hours, the tag automatically pops off the whales and floats to the surface for the researchers to collect. Using D-tags, Tyack and colleagues have learned how deep whales can dive. Beaked whales, it turns out, dive deeper than all other air-breathing animals to hunt for food. To feed on fish and squid, they may roam as deep as 2,000 meters, or more than a mile below the surface. To descend that deep, beaked whales spend a lot of time submerged—up to 90 minutes—after catching several quick breaths on the surface. Because they spend so little time on top of the water , they are notoriously challenging to study; Johnson described them as the “extreme breath-hold champions of all animals studied so far.” By comparison, a sperm whale may remain on the surface breathing for 10 minutes, giving researchers ample time to tag before the whale submerges again. During normal diving behavior, the whales’ lungs collapse when they dive deeper than about 70 meters. Lung collapse prevents more nitrogen from infiltrating the whales’ bloodstream and causing decompression sickness, Tyack said. The researchers unveiled a theory about why the deep-diving whales, in response to sonar testing, may sometimes succumb to the same decompression sickness that afflicts scuba divers. Tyack and Walter Zimmer of the NATO Undersea Research Center developed a mathematical model last year that suggests that beaked whales risk decompression if they repeatedly dive just shallower than the depth at which their lungs collapse. They further suggested that some naval sonars may replicate the sounds made by one of the whales’ predators, killer whales, and stimulate the whales to adopt this risky diving pattern. If exposure to sonars induces the whales to make a long series of shallow dives, during which the whales’ lungs do not collapse, the researchers’ model predicts that the increased pressure can cause nitrogen bubbles to form in some tissues. Limiting the duration of sonar testing may reduce this risk, the scientists concluded in a paper published in 2007 in the journal Marine Mammal Science. In August 2007, 60 scientists from 10 institutions gathered to launch a multiyear research project at the Navy’s testing facility in the Bahamas. The facility is known for its tropical temperatures (ideal for year-round work at sea), access to deep water (good for testing weapons and for finding deep-diving whales), and low commercial vessel traffic. All provide an ideal backdrop for military work. For scientists, the jewel of the facility is the seafloor hydrophone system. Researchers on land can see the hydrophone grid on computer monitors and acoustically track whales swimming beneath the surface. To eavesdrop on the whales, engineers at the Naval Underwater Warfare Center in Newport, R.I., developed a program called M3R (Marine Mammal Monitoring on Navy Ranges) to program the hydrophones to pick up the sound frequency of the “clicks” that beaked whales use to communicate. The frequency is too high for humans to hear. By five each morning, in the base’s onshore acoustics room, researchers began by identifying where the whales were located within the hydrophone array. The rectangular-shaped array, broadcast on computer monitors, showed colored lights representing each hydrophone. A green light meant no whale was nearby. But when it flashed red, the hydrophone was picking up something other than ambient sounds. 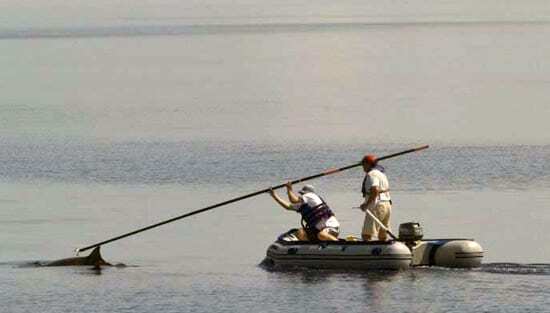 The researchers could determine if they were coming from a beaked whale, a sperm whale, or a boat passing through. Once researchers had a general idea of whales’ locations, other teams headed out in boats. 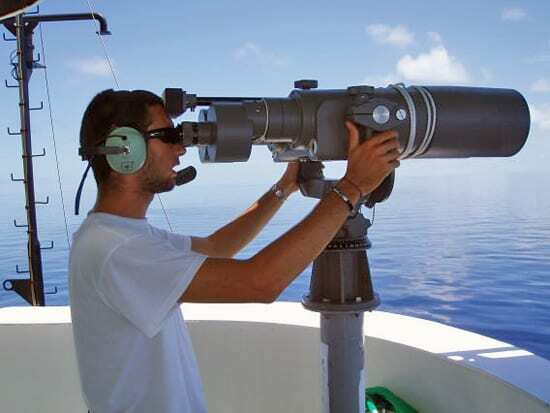 On one, the 192-foot Navy vessel Ranger, researchers peered through huge binoculars called Big Eyes, which allowed them to spot whales more than a mile away, and kept in radio contact with the lab on shore about the whale’s location. A second, smaller boat carried scientists to tag the whales with D-tags. Despite a rainy, windy season that limited full tagging operations to only about a quarter of the time, researchers placed tags on 10 whales, including six Blainville’s beaked whales and four pilot whales. Ranger also carried members of the sound source team. Once a whale was tagged, this team would emit sound into the water, including a sonar-like ping and calls from killer whales, so researchers could begin seeing how the beaked whales responded. 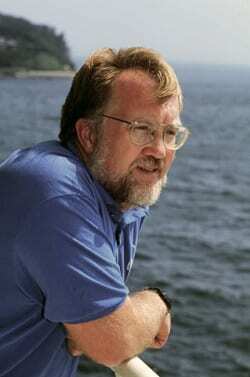 Tyack described the research as a balance between not harming the subjects and obtaining critically needed information about how the whales react to sound. Researchers used a less intense sound source than the Navy sonar in use when the whales stranded. They limited their work to the military range, where they could easily track the whales. Tyack stressed that there is no intent to expose the animals to harmful sound sources that would cause them to strand. To ensure that, he said that researchers constantly watched for indications of stress in the whales. For example, beaked whales are known to begin clicking when they dive below 500 meters and continue clicking for 20 to 30 minutes. The researchers waited until whales started clicking at depth before they played back sounds, and they stopped transmitting as soon as they detected that the whales stopped clicking. This procedure allowed them to detect a minimum sound exposure necessary to observe a response. “The point is to ramp up the intensity of the exposure over time,” Tyack said. Slowly, he said, they will get to a point where the whales show a measurable reaction to sound in the water. Additionally, a propeller plane flew over hundreds of miles of coastline after each playback to check for stranded whales in the region, and made sweeps out to sea to look for “floaters.” None were found. The research will continue in fall 2008, and by 2009, the scientists propose testing the sound on beaked whales in an area where they have likely had limited or no exposure to sonar sounds. That way, researchers can learn from whales that they know aren’t already accustomed to hearing the signals. Funding for the Bahamas beaked whale behavioral study was provided by the Office of Naval Research (ONR), the Strategic Environmental Research & Development Program, and the Chief of Naval Operations Environmental Readiness and Submarine Warfare Division. The research was conducted under a Bahamian permit issued by the Department of Marine Resources, and under permit #1121-1900 issued by the National Marine Fisheries Service (NMFS) under the authority of the Marine Mammals Protection Act and the Environmental Protection Agency. Funding for the studies of stranded animals was provided by NMFS and ONR. Does Acoustic Testing Strand Whales?